If you’re looking for a stroll down memory lane with this re-interpretation of Pink Floyd’s classic Dark Side of the Moon, you won’t find it here. This is a radical departure from the original, and I have to admit the first time I gave it a spin I was shocked and apalled at the same time. The creamy vocal harmonies throughout the original DSoTM had been reduced to the gritty bluesy vocals of Boris Savoldelli (sounding a little bit like Dr. John meets Joe Cocker), who apparently hatched the idea for this project and recorded it back in 2013, after which it sat on the shelf for three years. 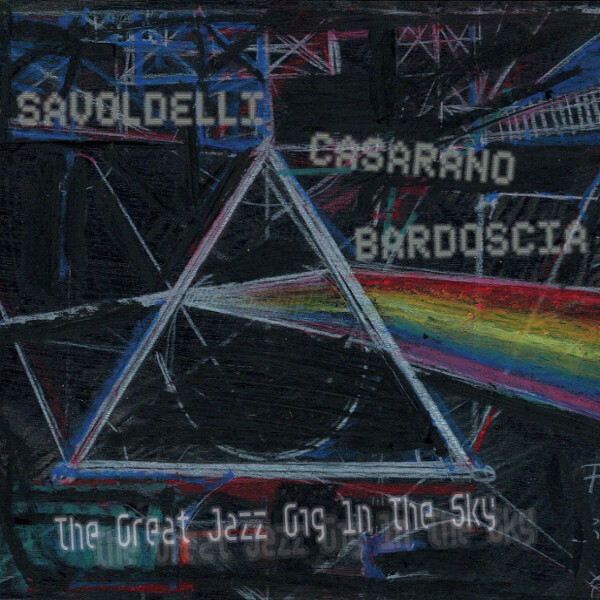 Joining Savoldelli on all of the tracks are double bassist Marco Bardoscia and saxophonist Raffaele Casarano, all three of whom contribute a measured amount of electronics. Also, Dewa Budjana turns in some fine guitar work on the near-15 minute “Us and Them,” where WK569 (whoever that is) adds some background sound manipulations on that and the brief follow-up “Any Colour You Like”; the opening narration on “The Great Gig in the Sky” and “Eclipse” is done by Maurizio Nobili. I suppose it was Budjana’s guitar work that brought me back for a second spin, which brought more clarity and understanding throughout, and through repeated plays (now at about ten times all the way through) I’m really liking this a lot; it’s nothing at all like the original, instead being a completely new approach to the vocals and arrangements, while not tinkering too much with the original compositions. Approach it with an open mind.